A kite is a quadrilateral with two distinct pairs of congruent sides. The common vertices of its congruent sides are called its ends. In quadrilateral below, the distinct pairs of congruent sides are & and & . The ends are and . Exercise: Locate the ends and the pairs of the distinct pairs of the remaining quadrilaterals. In this post, we are going to prove the Kite Symmetry Theorem. 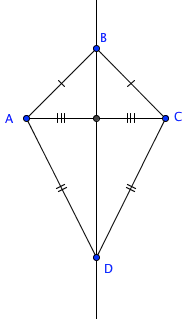 The theorem states that the line containing the ends of a kite is a symmetry line for the kite. In proving this theorem, we are going to use the Figure Reflection Theorem which is stated as follows. If a figure determined by certain points, then its reflection image is the corresponding figure determined by the images of those points. Now, we proceed with the proof. The line containing the ends of a kite is a symmetry line for the kite. Let be a kite with with ends and . and since the ends of the kite are and (definition of the ends of a kite). Triangle and triangle are isosceles since each triangle has two pairs of congruent sides (definition of isosceles triangle). We draw , and let line be the angle bisector of . The reflection of A through is and the reflection of through is (definition of reflection). Now, line contains and since the bisector of an isosceles triangle is the bisector of the vertex angle and therefore contains the vertex. There reflection of through is itself and the reflection of is itself (definition of reflection). The reflection of through is by the Figure Reflection Theorem. Therefore, line m which is also line is a symmetry line for (definition of symmetry line).